Twenty-two Open contestants will advance to the clean-slate Stakes finals on Friday and Saturday. It took a 647.5 score and above to make the Open finals, and the high score of the preliminaries, a 659 (222 herd/218 rein/219 cow) belonged to Call Me Mitch (Metallic Cat x Miss Hickory Hill x Docs Hickory), shown by Paso Robles, California, professional Phillip Ralls. Ralls and the 2011 stallion, owned by Estelle Roitblat, won the herd work go-round on their way to the finals. The National Reined Cow Horse Association Stakes Open herd work prelims wrapped up at the South Point Equestrian Center in Las Vegas, Nevada, on Tuesday. Call Me Mitch (Metallic Cat x Miss Hickory Hill x Doc’s Hickory), shown by Phillip Ralls for owner Estelle Roitblat, won the go-round with the 222 they scored on Monday. 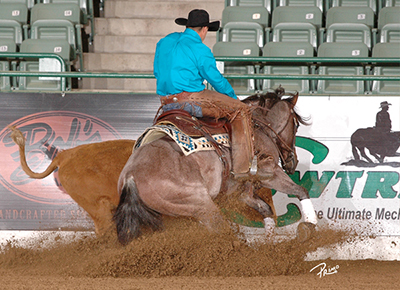 Ralls and the 2011 roan stallion also top the composite on two events with a 440. Riding Annies Smarty Cat (Metallic Cat x Lil Miss Smarty Chex x Smart Little Lena), Marjie Robinson scored a 218.5 in the Stakes herd work prelims to win the Non Pro, Intermediate Non Pro and Novice Non Pro go-rounds. Annies Smarty Cat is a 2011 stallion owned by Robinson’s husband, Ted Robinson, a NRCHA Hall of Fame horseman and Million Dollar Rider. Annies Smarty Cat is the last foal out of the NRCHA Hall of Fame horse Lil Miss Smarty Chex, a 1987 mare who was a leading producer of reined cow horse champions.